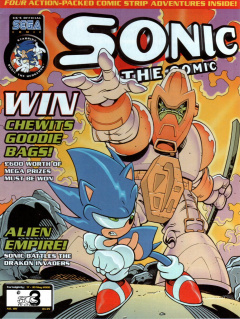 Sonic the Comic #181 is the one-hundred and eighty-first issue of the Sonic the Comic series by Fleetway Editions Ltd.
1.1 The Origin of Chaos! High up on a cliff, the Great War between the Echidna and Drakon Empires is about to begin. Launching a barrage of missiles at the echidna settlements to show that they mean business, the Drakons plan to retrieve the Chaos Emeralds that the echidnas had stolen from them two days before. Down in Megaopolis City, Sonic has found out about the echidnas' thievery of the Emeralds and is now demanding answers from Pochacamac on why he has been brought here and what's going on, but before he can ask any more questions, the Drakons' missiles hit the building. Ready to lead his warriors into battle, Pochacamac is interrupted by a stubborn Sonic, still demanding answers. Pochacamac explains that the Drakon Empire had arrived on Mobius months ago. It was not clear then what they wanted, but soon enough, the Drakons took control of the echidnas' sacred Emerald mines and developed an unstable energy source known as 'Chaos' energy that was far too dangerous to control. By using the stolen Emeralds, they were able to control this energy, creating the Chaos Emeralds. Fearful of the Drakons being able to siphon the Chaos energy into a thousand Emeralds and thus enabling them to conquer the galaxy, the echidnas took the Emeralds back, albeit now super-powered. As for how the echidnas brought Sonic to the past, Pochacamac and his family is gifted with the power to see into the future, and foresaw Sonic as the great champion who is the sworn enemy of the Drakon Empire, so he summoned him here to help. Pochacamac is interrupted by the captured Drakon Prosecutor, who has been brought in for the echidnas to discuss negotiations. However, at that point, the invasion force comes crashing through the wall to attack. A huge battle ensues, with the echidnas preparing advanced Guardian Robots for the fight. Sonic easily dodges Sentinel blasts, but a stray shot hits the Chaos Emeralds, causing them to react badly and forcing everyone to evacuate quickly. Stray chaos energy destroys the fish tank holding the Prosecutor, leaving him stranded on the ground as his comrades leave him. A massive explosion kills and destroys many, but the aftermath leaves the creation of a deadly beast from the remains of the prisoner himself - Chaos! Data Zone: The Data Zone acts as a quick reference guide to new readers about the characters, providing data files on Sonic, the Ancient Echidnas, the Drakon Empire and Chaos. Graphic Zone: Fan art submitted by readers. The theme for this issue's Graphic Zone is "Chaotix Crew", featuring drawings of the Chaotix Crew. Owners of the printed art each won a Sonic the Hedgehog digital watch. A competition to win Chewits goodie bags. This page was last edited on 19 March 2019, at 16:25.